Shamaila Khan, owner of McLean Playtime Daycare, is a family child care home provider who participated in the Loudoun County Virginia Early Care and Education Learning Collaborative (ECELC) in 2016. 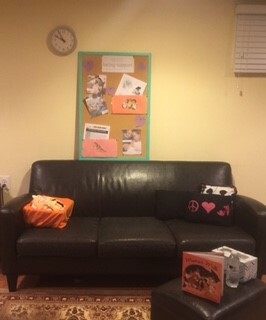 Shamaila was working on a goal of providing a comfortable private breastfeeding space and resources to the parents of the children attending her family child care home. She created a quiet space in the basement of her home that allows mothers to breastfeed comfortably. Mrs. Khan also placed flyers and pictures supporting breastfeeding on her bulletin board. Mothers are now able to breastfeed in an environment that encourages and supports breastfeeding. There are books for young children that show animals breastfeeding. This enables young children to see pictures of other living things that breastfeed their offspring. There is also a stuffed animal cat breastfeeding her kittens which is a great visual for young children to understand that breastfeeding is a major source of nourishment for all living things. Thanks to the ECELC program, Shamaila witnessed the benefits of breastfeeding and was motivated to make a positive change in her program. The Learning Place in New Jersey cares for children 2 months to 6 years old. At the very first learning session of ECELC, the staff found out how to provide optimal and appropriate accommodations for breastfeeding within their program. This guide from La Leche League describes different types of pumps, and how to make pumping as comfortable, effective and stress-free as possible. This is a perfect pamphlet to have in your breastfeeding area for moms.